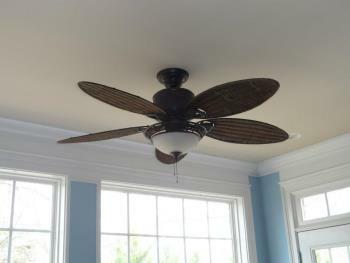 Professional ceiling fan installation in Athens, GA ensures your home or office is safe. Meehan Electrical Services has been working in the local area for years, providing expert installation on the latest ceiling fans and light fixtures. Our qualified and fully trained technicians can handle every aspect of your ceiling fan installation, from sizing the junction box to mounting the fixture and installing light bulbs. Athens residents that try DIY when installing a ceiling fan soon find out the complications typically associated with this job. Heavy fixtures, tight spaces and complex wiring require the attention of the professional electricians at Meehan Electrical Services. Working in the local area since 1960, Meehan Electrical Services has been providing complete ceiling fan wiring and installations for an affordable and competitive price. This allows anyone in Athens to enjoy a safe, reliable ceiling fan installation, without needing to break the budget or attempt it themselves. Ceiling fans provide better energy efficiency and a more comfortable living space in homes across the region. Trust Meehan Electrical Services for Athens ceiling fan installation you can depend on. Our solid warranty covers product defaults and installation, and the trained Meehan Electrical Services staff will work hard until you are completely satisfied with your new ceiling fan. For professional, affordable and reliable ceiling fan installation in Athens, GA, contact the staff at Meehan Electrical Services. Call (706) 717-4947 today and book your free estimate on this simple, yet valuable project.